Now we come to that part of the year when knitting shows its true value. Frenzied gift-knitting is past. The sun never truly lifts overhead--setting early, rising late, it merely tracks along the southern horizon. Sometimes dawn brings white snow reflecting blue shadows, blue skies. Some days trees crack and cardinals mob the feeder. But most days dawn to low gray monotony, sparrows scrabbling under the lilac bush. Indoors, maybe, something good is in the oven. Each kid is plugged head-first into a glowing entertainment rectangle. The knitter sits down for a little while in a comfy chair with two mismatched needles and some scrap yarn. "A swatch? A baby cap?" asks the spouse carrying another cup of coffee. "We'll see how it goes" says the knitter, the mind's eye instantly crowded with caps become swatches; swatches, caps--a knitted bridge to winters past. Or maybe cabin fever has gripped everyone and the knitter takes refuge in mindless stockinette: 4 different socks worked leg-tubes only, the fifth on the needles, all shaping waiting for that day (Lord, let it come soon) when the kids head back to school. Heels stack up, waiting to be knit in silence. The knitter alone has a different rhythm: winter solitude blossoms into complex cables, endless counting, immense projects. One bright winter's day, the knitter hunts out the afghan pushed aside by last spring's daffodils. Silently counting the squares still to work, optimism swells--why it's more than half done! This bright optimism lasts the evening through. Needles flash. The moving luminescence in the hand commands close attention. Dark thoughts flit away from the lit circle of work. It may seem the knitter moves the knitting forward, stitch by stitch. Yet in these short days, it is knitting which moves the knitter forward little by little towards a time surely coming. In our hands, the gray days transform into a summer camisole, perhaps, or a baby swaddled in color, a baby not yet timely, yet kicking to get out nonetheless. 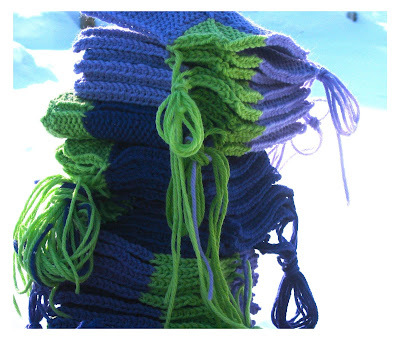 Knitting carries the knitter the long winter along, towards the life of spring.